In this article, We’ll guide you through the world of motion sensors, explaining the various types that are out there, and which you might want to install in your space based on your needs. What does a motion sensor do? As the name suggests, a motion sensor tracks motion. But how does it accomplish this, practically? To answer this, we have to employ Elon’s Musk’s favorite way of thinking, first principles, and define what we mean by “motion” in the first place. Motion is, according to common use, a change in position over time. Some of us might remember now the classic formula we learned in high school, defining velocity as the rate of change of position over time: well “motion,” as vague a term as it is, can be generally defined along the same lines as velocity - a change in the position of a given object over a span of time. In order to measure the motion (velocity) precisely, we have to know exactly what the change in position was, and what the span of time was, but this isn’t necessarily important right now. At their core, motion sensors generally restrict themselves to detecting whether there is motion, as opposed to measuring the exact velocity of the object in motion. How they accomplish this task changes according to the exact nature of the motion sensor, though. We will now explore some of the major kinds of motion sensors out there. It records snapshots of the environment, and compares them over time to see if there are changes caused by the motion of objects. This one here is what we call a passive IR sensor - more to come on that in the next section on types of sensors! 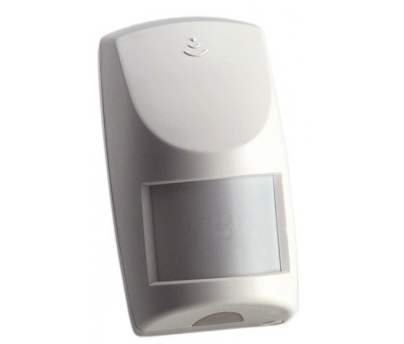 Different types of motion sensors have different methods for capturing motion. In this section, we will review the two major kinds of motion sensors, exploring their differences as well as their similarities. This first category of sensor is made up of all those sensors that detect infrared light rather than regular visible light. Infrared radiation is, as many of us probably remember from high school science, a section of the light spectrum just under visible light. It’s generated by the same thing that generates like - photons - but they’re invisible to the naked eye. In practice, humans perceive IR light as heat. If an object (like a lightbulb) is emitting infrared light, we won’t be able to see it, but we’ll feel it as an increase in heat. Thus is actually the same reason why pots and pans on the stove start feeling warm right before they start glowing a dull red! They are emitting first in IR light (as heat), and then as they get hotter they move to visible (red) light. And this is where the classic still of every action movie ever comes from, with the hero/heroine donning their IR goggles, and detecting the bad guys. Here’s an example photo, except that instead of a bad guy, it’s a cute kitty! You may have heard this called “thermal vision” in these contexts - now you know why! You’ll notice the temperature readings on the side of the screen - at these temperatures, bodies don’t emit light with high enough energy to be in the visible spectrum, but they are in the IR spectrum. PIR sensors rely on the principles of IR light described above. Basically, you will place one in the top corner of a room you want to track, and as per the definition of motion discussed above, they will measure changed in IR radiation from one moment to another. If the IR (heat) signature of a room changes from one frame to the next, it must mean that an object inside that room moved, and this triggers the motion sensor. For a more in depth dive into PIR sensors, please review this article. 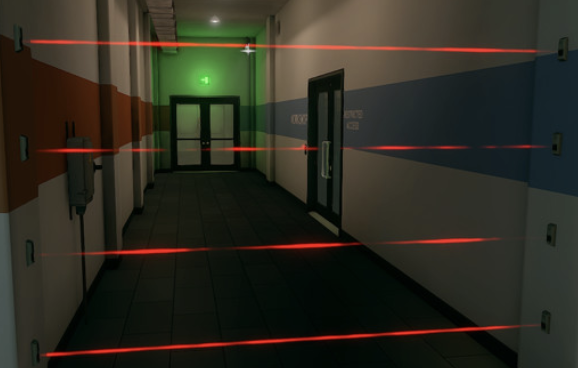 Tripwires are another kind of infrared sensor, though you may know them by the name of “lasers” or “laser sensors.” If you’ve ever seen a spy movie, chances are that they have at some point sprayed a doorway with something and all of a sudden a laser appears, and they gingerly step over it. This is an IR light tripwire, that implements a different sort of motion sensing to track motion. These tripwires have 2 parts: an active and a passive end, or an emitter and a receiver. The emitter emits a beam of infrared light (so as to make it invisible to humans), and the receiver is so placed as to be in the way of that beam. Then, when someone steps across the beam, it is interrupted for a brief moment, and the receiver notices that there is no beam, and interprets that as motion across the entryway or doorway that it is monitoring. It will then trigger its alarm ant notify an admin that motion has been detected. Video cameras, as opposed to IR sensors, detect visible light. There are many different kinds of video cameras - for an in-depth overview of the different kinds and their various use-cases, check out our physical security guide. For the purposes of motion detection, video cameras employ similar strategies to PIR sensors. They take snapshots of the space (this is actually just what video is - a series of still pictures presented in quick succession), and if there are any differences in the image from one frame to the next, that is interpreted as motion, and the video camera raises the alarm. The three different types of motion sensors all accomplish the same purpose, but all do it in different ways. The first obvious use-case is that of the tripwires: if you just want to secure an entryway, or point of ingress, and just know if somebody entered or exited the space, then this would be your obvious choice. You can simply install it around shin height, so that people don’t involuntarily step over it, and you’re all set. For the other two, though, the differences are more subtle, with the main similarity being that both will be installed from high vantage points, somewhere with a birds-eye view of the room. PIR sensors are generally more discreet, and require less power, and crucially can “see in the dark.” Given that warm bodies like humans emit their own IR light, you don’t need an ambient source of visible light to detect them, so it doesn’t matter if the room is totally dark; you’ll still be able to detect motion. Unfortunately, though, the nature of those heat signals is that they are rather murky, especially with most commercially available systems. So while you will be able to tell if there is a person in the room, you generally won’t be able to tell how many people are in the room, or any sort of granular data on size/shape of the intruder. Video cameras, on the other hand, can provide much more detailed data on the room: the quality of the stream will be much higher, and you’ll be able to tell not only if there is an intruder, but also who the intruder is, and what they were doing. However, humans don’t actually emit visible light, so the major fault of video cameras remains that they’re useless in the dark. Also, they’re generally much more conspicuous than PIR sensors, giving would-be intruders the go-ahead to work around them. Kisi’s advice would be to use some conjunction of all three of these sensors to fully secure your space. You’ll want tripwires at the sensitive entry points, and either PIR sensors or video cameras in important rooms, where you can get better data on what actually triggered the sensor. While throughout this article I’ve been mainly discussing motion sensors in the realm of intruder detection, a more everyday and very exciting use-case it its integration with access control. It’s important to note, though, that I’m only speaking here of modern, future-proof access control systems like Kisi’s, and not your traditional lock-and-key mechanisms. With modern access control solutions, connectivity is key, and you can actually link up various motion sensors to the main controller of the system. By wiring them together, and programming them, you can actually arrange for doors to unlock when motion is detected (or, conversely, to lock up when unexpected motion is detected). 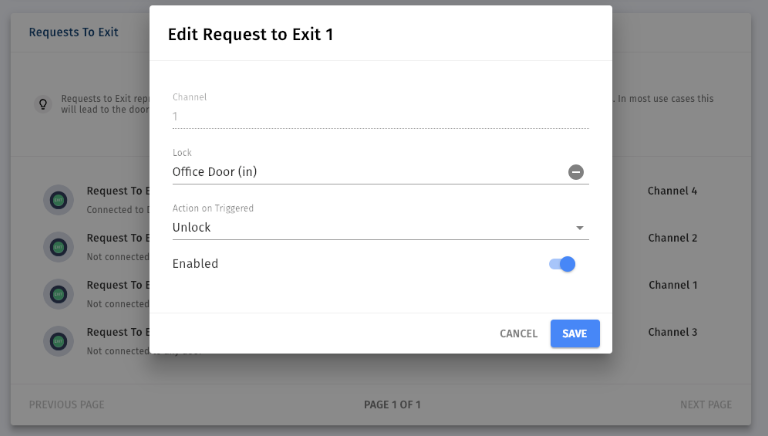 Kisi’s solution has the option of wiring “request to exit” buttons to the door readers, but thanks to the customizability, these can actually be replaced with motion sensors such that the door unlocks automatically, granting users a much more seamless experience. For technical help on this, please visit this link! The future is also very exciting for these sorts of integrations. At the moment, even the most modern systems like Kisi’s can only make use of PIR sensors for basic motion. However, modern facial recognition systems are increasing in sophistication and speed. 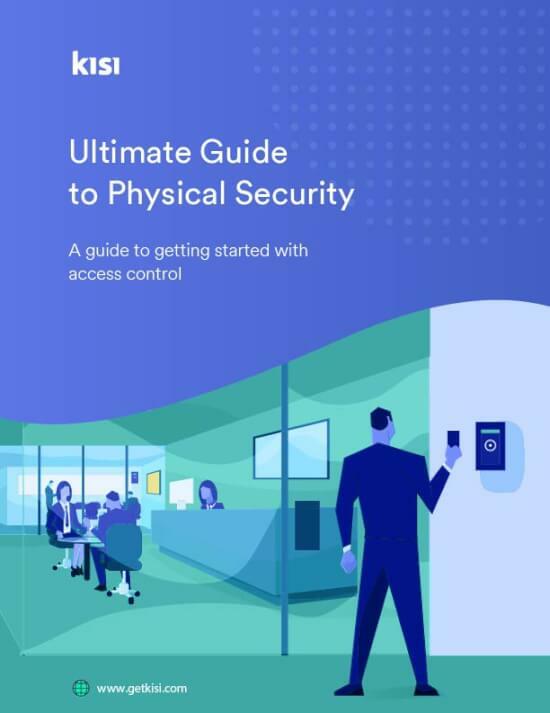 It’s certainly not a big leap to think that a couple of years in the future, access control systems like Kisi’s cloud-based controller could be connected to video cameras, and thanks to the remote cloud control, companies like Kisi could use facial recognition to only unlock the door for recognized guests. Based on the type of motion sensor you have, you’ll want to make a conscious decision about whether you want to self-monitor it as an IT or operations manager, or whether you want it to be monitored by an external third party — like the company itself, or an automated system. In general, monitored services tend to be more reliable, with false alarm detection, quality controls, failsafes, and backups, but they are usually costlier (with licensing fees), and less ﬂexible/conﬁgurable, coming in pre-established pack sizes. As a general rule, a larger building with more doors, more sensitive rooms, and more to lose, will want to go for a monitored system with a trusted, established company, whereas a smaller or more niche business might want a more versatile and self-monitored option. What are the motion sensors trying to accomplish? There is also the question of what the motion sensors are attempting to accomplish. 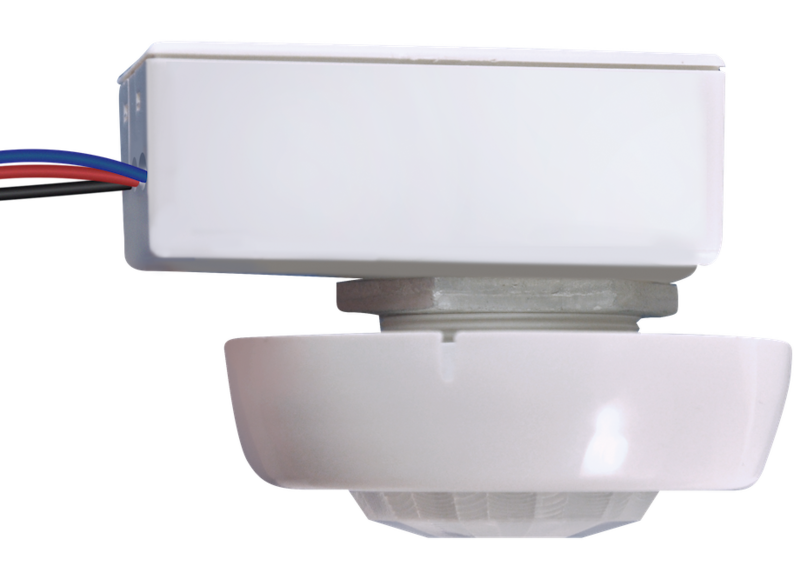 If you have tripwires or PIR sensors that are mainly active at night, and are there for intruder detection, then it is clear that you will want a monitored system. It’s doubtful that some admin or IT manager will be awake at all hours of the night to receive the signals and act accordingly. However, if all you have is a PIR sensor integrated with access control, or a security camera that can only really function during the day, when employees are present, then maybe a cheaper self-monitored system can be sufficient. Even then, though, a monitored system can generally perform more pattern tracking and data analysis, as we’ll get to in the next section. In general, despite the sometimes elevated recurring costs of a monitored system, our recommendation would be to make the leap and spring for a professionally monitored system if you want your office truly secure with 24/7 response times. While modern motion sensors are certainly advanced and provide a high level of safety, unheard of up to a few years ago, the future of the industry is very exciting. We will ﬁrst explore the emerging, interconnected sophisticated systems appearing, and move on to our favorite topic, predictive data analysis that’s automatic. Connectivity is the hot topic in home and office security; the most modern offerings are integrated systems, where each component of your security suite communicates with the others. This way, they are better able to track activity and use of the office/home, and provide you with more comprehensive and fool-proof security. We’ve already covered access control integrations, but to give another example, if your motion sensor is connected to your smart light bulbs, you can program them to turn on automatically when motion is detected. With the emergence of smart home and office systems like Amazon Alexa, or Google Home, this connectivity of all smart appliances is truly a hot topic, and likely to only increase in magnitude over the next few years. Another rich path of innovation, on the back end of these systems, is the increase in complexity of the data analysis algorithms that track your office security and use data. As I discussed in the monitored vs self-monitored section, the best security systems for larger offices will be monitored by third parties (the security companies themselves) and innovations in data algorithms for monitoring will make these even more effective. A prime example is in fact motion sensors: for an office of any size there will be dozens, if not hundreds, of employees and visitors moving around, and even after hours, there could be people working late, or coming in at odd hours because they left something behind. Simple PIR sensors, tripwires, or video cameras will not be able to differentiate between these and unwanted intruders. With the more sophisticated modern algorithms, though, beyond just telling you if someone entered at an unusual hour, they will be able to tell you, for example, if there are an inordinately high amount of people at a given time—possibly indicating that the office is over-crowded, and prompting you to take action accordingly. Data science is a very exciting ﬁeld, and its applications to home and office security present some very appealing paths to innovation. Motion sensors, as discussed, come in various shapes and sizes. They have myriad use cases, ranging from simple intruder detection, to automatic door opening with access control integrations, to potential more sophisticated uses like facial recognition. Whatever your use case, though, hopefully this article has given you a better idea of what is out there, and why you would want motion sensors for your space.